As we get older the likelihood of developing cardiovascular disease increases. 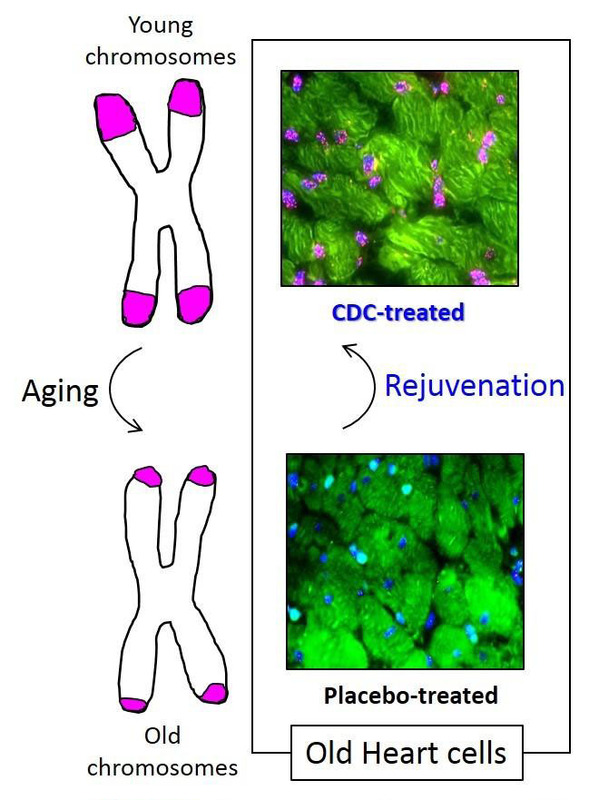 Cell senescence underpins the cardiac aging process, and this is characterized by the shortening of telomeres, the end caps on our chromosomes. Telomere shortening is associated with heart dysfunction and hypertrophy, impaired cardiomyocyte proliferation, interstitial fibrosis, and reduced regenerative capacity. Dr. Marbán’s team completed the world’s first human cardiac stem cell infusion back in 2009 as part of a Phase I trial in heart attack patients. In the latest animal studies, the researchers tested whether cardiosphere-derived cells (CDCs) from newborn rats could reverse or hold back aging in the hearts of old animals. CDCs are cardiac progenitor cells that can differentiate into the three primary cardiac cell types—cardiomyocytes, endothelial cells, and and smooth muscle cells. Genetic analysis identified treatment-related changes in the expression of 37% of the 168 genes implicated in tissue aging and cellular senescence pathways, primarily those involved in cell cycle control and immune response. “Most of the CDC-related changes (85.5%) directionally recapitulated the gene expression patterns of young animals,” the authors write in their published paper. Dr. Marbán was previously at the Johns Hopkins University, where he pioneered the process for growing cardiac-derived stem cells. The technology has since been licensed by the Johns Hopkins and Cedars-Sinai to Capricor Therapeutics. Capricor’s lead allogeneic cardiac cell therapy candidate, CAP-1002, is in clinical development for treating heart disease associated with Duchenne muscular dystrophy and has also been evaluated for adult cardiology indications.